These Bourbon Pecan Pie Bars feature a buttery shortbread crust with a bourbon spike filling loaded with pecans and chocolate chips. Would you believe that this was my first time making pecan pie? It’s true. 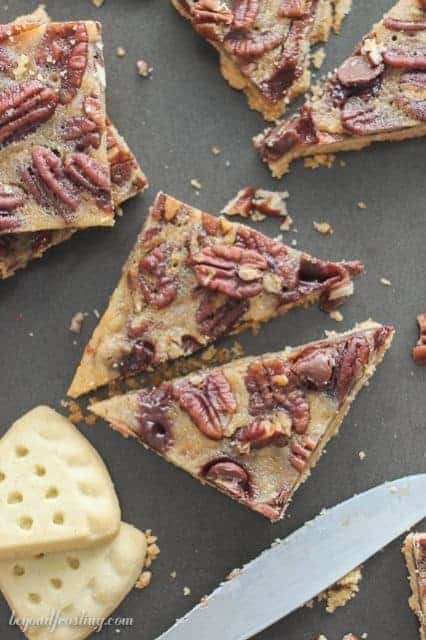 I didn’t really grow up eating pecan pie, but I’ve been exploring my pie options while I am working on my cookbook. Pecan Pie was on my list of things to try so I could experience the flavors. Beside that, I was having major pecan pie envy for all the recipes I kept seeing from my blogging friends. 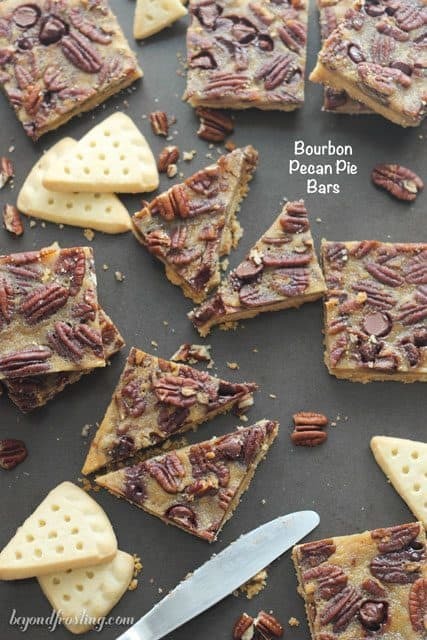 I am thrilled to be sharing these Bourbon Pecan Pie Bars with you today. 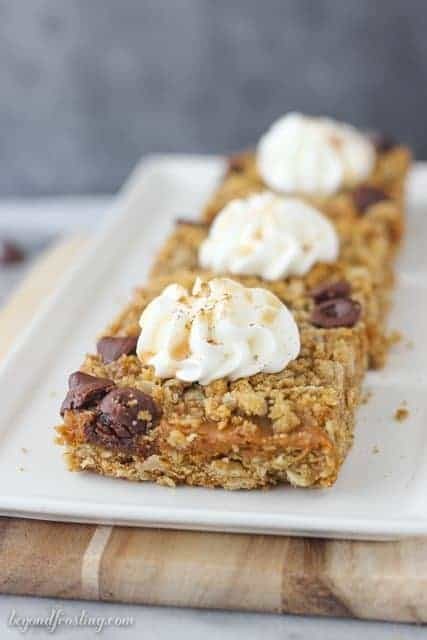 These bars are made with buttery Walkers Shortbread cookies, bourbon infused pie filling layered with chocolate chips and pecans. 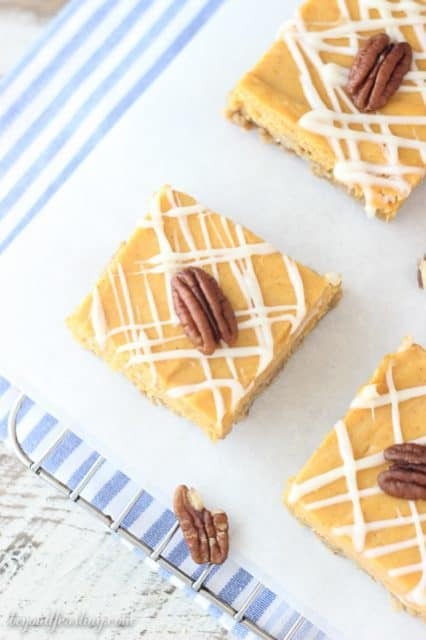 Bourbon seemed like just the right complement for these bars. Last Christmas, we were having dinner at my boyfriend’s grandparents’ house. They are so kind and supportive of my blog; maybe it is because I bring them a rum cake every so often. Anyway, while I was helping to prepare the dinner, I came across his grandmother’s recipe box. It was really fun to see the types of recipes she had collected. 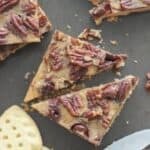 One of the recipes that caught my eye was a deep dish Kahlua Pecan Pie. It’s been on my to-do list since I found it. I decided to swap out the Kahlua for bourbon in these bars. I halved the recipes, which was the perfect amount of pie filling. 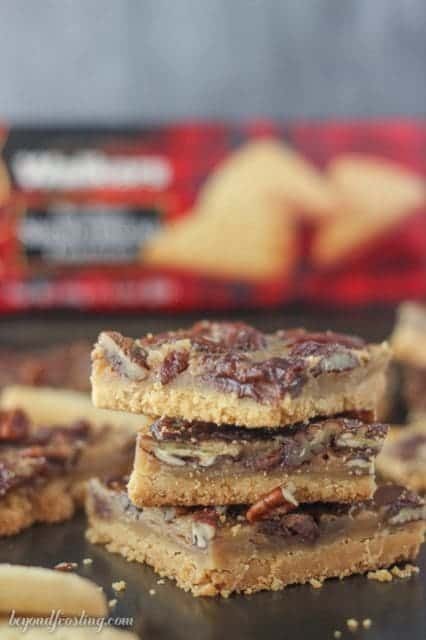 I am so happy to be partnered with Walkers Shortbread for this recipe. Did you know that Walkers was the very first brand that I partnered with on my blog? 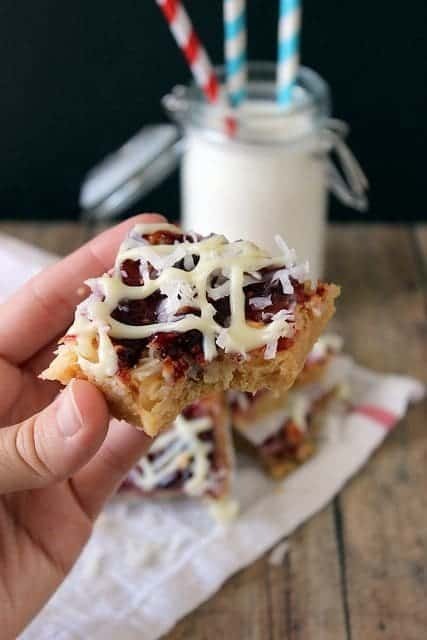 I made recipes like these Lemon Raspberry Shortbread Bars, Peach Shortbread Parfaits and Toasted Pecan Shortbread Bark. 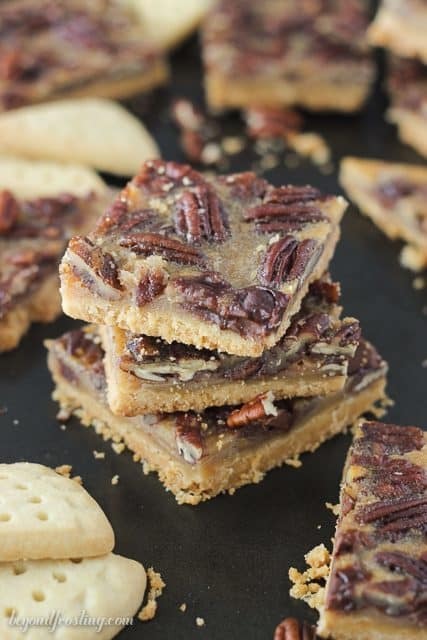 For the crust on these pecan pie bars, grind the shortbread cookies into a fine crumb and mix them with some butter. After you press them in the pan, it is best to pre-bake the crust for 10 minutes before adding the filling. It is really important that you allow these bars to cool for a couple hours before attempting to cut. I actually refrigerated mine before cutting because it helps keep the crust firm when cutting. I always liked my pie cold, whether it be pumpkin or apple. Now I am so happy to be adding pecan pie to my rotation. This post is sponsored on behalf of Walkers Shortbread. I’ve been compensated for my time to create this recipe. Thank you for supporting the brands that I love. Walkers was my very first supporter! Preheat oven to 400°F. Line a 9-inch by 13-inch pan with parchment paper or a silicone baking mat. 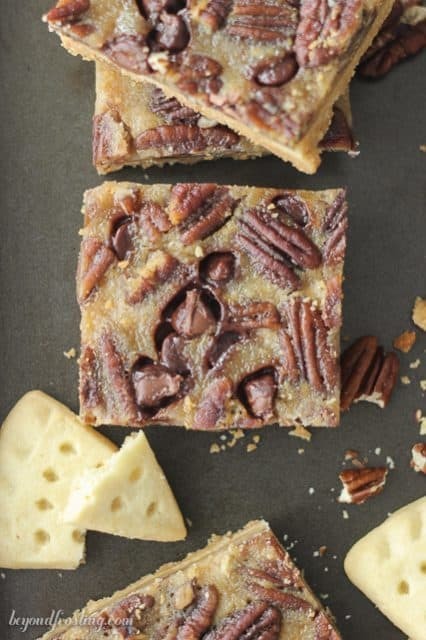 Grind Walkers Shortbread into a fine crumb using a food processor or blender. Put crumbs in a microwave-safe bowl. Add butter and microwave for 45-60 seconds until butter is melted. Stir to coat shortbread cookies in butter. Press crust firmly into the bottom of the pan. Pre-bake crust for 10 minutes at 400°F. Combine butter, sugar, vanilla and flour in a large mixing bowl. Beat on medium speed until light and fluffy; 2-3 minutes. Add egg and continue beating until well combined, scrape down the sides of the bowl. Add bourbon, corn syrup and evaporated milk and mix until all ingredients are blended. Stir in pecans and chocolate chips. Pour filling into pre-baked shortbread crust. Bake bars at 400° for 15-20 minutes until filling is set. Filling should not be jiggly but rather still a little soft. Use a toothpick to test the middle. If the toothpick is clean, the filling is baked through. Allow filling to set and cool for 3 hours and refrigerate before cutting. Walker Pure Butter Shortbread Triangle Cookies. I haven’t seen this brand before. Hi Carla, you can use any Walkers shortbread cookie you can find! I’d never made pecan pie until last week too! No idea why that was but I think we both need to make up for lost time with these bars!